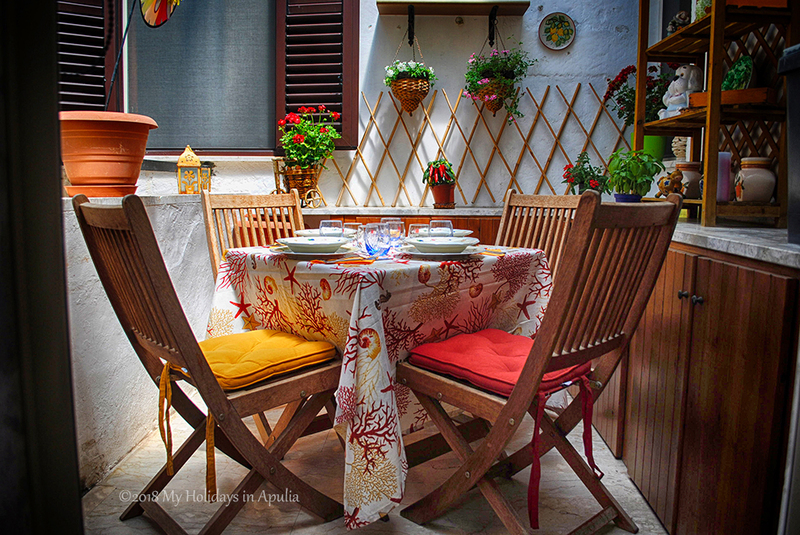 Sieglinde apartment is a lovely property which dates back to the end of the XIX century. It is a first floor typical vaulted ceiling apartment with three spacious comfortable rooms and a bright porch next to the well catered kitchen, where our guests can enjoy their meals. Sieglinde apartment can comfortably provide lodging to six (6) guests. A long balcony is on the front of the street, where there are two master bedrooms and a very quiet twins bedroom, ideal for children, is next to the sitting room. There are two bathrooms: one is full equipped with bath tub and shower and in the smaller one there is a shower and a corner for the laundry. A cosy fire place area is where guests can toast their Italian holiday in a good local rosé wine, enjoying the BBQ and a fine romantic dinner by candle light, or simply relaxing by listening to music. The apartment has free WiFi internet and free parking on the street. Sieglinde ist eine elegante Ferienwohnung aus dem Ende des 19. Jahrhunderts mit alten Gewölbedecken. Das Ferienhaus steht im ersten Stock, es hat drei geräumigen Schlafzimmer und eine helle Veranda neben der gut ausgestatteten Küche. Da, können die Gäste ihre Mahlzeiten einnehmen. Die Sieglinde Wohnung bietet Platz für sechs (6) Gäste. Ein langer Balkon ist auf der Vorderseite der Straße, wo zwei Hauptschlafzimmer sind. Ein ruhiges Zwillingsschlafzimmer, ideal für Kinder, ist neben dem Wohnzimmer. Es gibt zwei Badezimmer: eines ist voll ausgestattet mit Badewanne und Dusche und im kleineren gibt es eine Dusche und eine Ecke für die Wäsche. Die Ecke des Kamins ist der ideale Ort, um zu entspannen, Musik zu hören und lokale Köstlichkeiten zu probieren oder guten Wein zu trinken. Das Ferienhaus verfügt über kostenfreies WLAN und kostenfreie Parkplätze an der Straße. Lecce is an historical city in the heart of Salento and one of the provinces of Apulia region, in the South of Italy. Very often, it is also called ‘Florence of Southern Italy’, because of the magnificent Baroque art styled monuments and noble palaces, stunning architecture, which you can find also everywhere in Salento area. A nice stroll in the city would bring you to visit the amphitheater in Saint’Oronzo Square, where you can stop also for having a creamy ice-cream, then heading for a peek at the beautiful Baroque Santa Croce Church, for example, and at the front of Celestini Palace, at the Dome, along the main shopping street, at the Castle Charles V. The city has also a long traditional bond with the Greek culture, which dates back to its old origins. Indeed, there are suggestive tiny villages in the nearby that are identified as Grecìa Salentina, where natives still speak griko, an old language, which reminds of the old Greek. Lecce is also an important centre for the production of local, golden extra virgin olive oils and ruby wines, such as Primitivo and Negroamaro, as well as for its fine ceramics. The crystal clear sea of both the rocky Adriatic and the sandy Ionian coast is not so far: a pleasant driving will bring you in stunning places, where you will enjoy great time in the sun and having a swim or perhaps taking fabulous pictures for your album of memories: Torre dell’Orso, Otranto, Castro, Santa Maria di Leuca, Gallipoli, Porto Cesareo…and of course there is a lot of more heading in the inland for visiting very fine cultural centers.